Proudly serving ALL Southern Arizona from Marana , Green Valley, Sierra Vista, Saddlebrooke, Vail, to Nogales. Tucson Turf LLC is a licensed, family-owned and operated small-business in beautiful Tucson, AZ. We are the leaders in Southern Arizona for all your artificial turf needs. When it comes to artificial turf we do front and rear yard lawns, putting greens, play areas, dog-runs, and many other custom applications. Along with our residential work we also handle larger commercial jobs including schools, churches, military bases, and many more. We are constantly looking and dealing with the very best American-Made products the industry has to offer. There are many advantages to using Tucson Turf, here are a few: We are actually from Tucson so we have lifetimes of experience in dealing with our unique climate and issues. We aren’t tied to any one manufacturer so we truly can get you the turf of your choice instead of the turf we have been contracted to sell. We have the ability to find a way to help each and every customer we come into contact with, without having to check with a regional or national office for approval. And we are especially confident in the team we have put together from the live person answering the calls to the last person shaking your hand as we head out the gate. The entire team are professionals who understand your happiness is the key to our success. On behalf of the entire team and our families, thanks for the opportunity to earn your business. We appreciate you going green and going local and look forward to helping you have a great experience with your project. Thank you so much for the great job you and your folks did installing the turf in the backyard. Who knew one day with Tucson Turf could completely transform the look of my backyard. The turf brings so much color to my previously boring rock yard. I have a small yard and the Tuft makes it look so much bigger. I love how the Turf looks so natural without any of the fuss of real grass – not to mention it much better for my allergies! My two small puppies love their new playground. They used to tip-toe around on the rocks – now they run and play like crazy! They hate it when I thrown their ball and it lands on the rocks – they come to an abrupt stop at the end of the grass and just look at it. After playing and chasing each other on the grass for awhile, they love to lay on the grass to catch their breathe (and pose of a quick pic). Thanks again. We recently had a Tucson Turf lawn installed, and with 4 dogs it has made all the difference. The interior of our home is much cleaner without the dogs tracking in dirt from the yard. The lawn is very natural looking and there is very little maintenance. The staff at Tucson Turf was very professional and did an excellent job throughout the project. Thank you! As an Operation’s Manager, one of my responsibilities is to solicit estimates on pending jobs in an effort to find not only the best price or product but the best fit for our mission. Toby and his Tucson Turf presentation was a winner on all counts. Toby’s intimate understanding of animal needs proved to be an instant connection. From product selection, on time scheduling, and neat, timely installation, you couldn’t ask for more from a contractor. The onsite crew was fastidious, and courteous and shared Toby’s wholesome outlook and pride in their job and product. 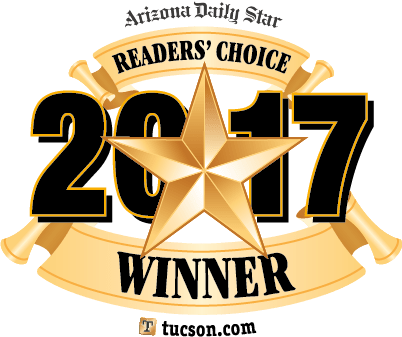 Jim in the Business Office was equally responsive and together all made this endeavor a true success … Tucson has a winner in this firm! An extended big thanks from all involved on our end. Tucson Turf transformed our back yard from a barren wasteland for the dog to an oasis for the family. Jim, one of the family members who operate the business, came and listened to our concerns and desires. He showed us what they could do and suggested a landscaping company that could do the rest. The two worked together during the process. The entire process was stress free. Every individual involved was punctual, professional, and attentive. Upon completion, Toby, the owner, was there to guarantee our satisfaction and answer any last questions. The estimate of time and cost was fair and adhered to. Every step was explained, advice was offered, and the finished product is beautiful and practical. 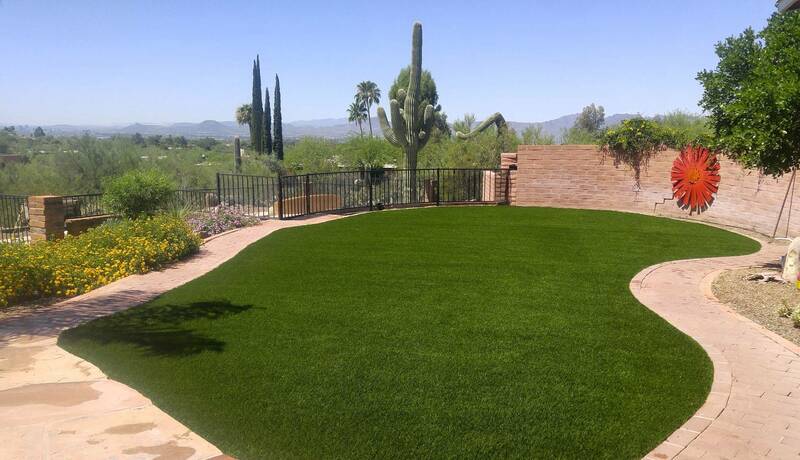 We highly recommend Tucson Turf for the transformation of your property. Can’t tell how impressed I was with your people. Very Efficient, Hard working, and very Polite. They spent 7 hours at my home installing your Tucson Turf, and the results were excellent. I am extremely happy with the way things turned out. You are welcome to bring any potential customers in Oro Valley to my home to look at the results. It was a pleasure working with you and your people.